Group Membership: Power Broker Inc.
Powers/Abilities: Mangler received enhanced strength and durability from the Power Broker treatment. History: (Thing I#36) - Mangler participated in the battle against the Thing and Ms. Marvel (Sharon Ventura) after their raiding of the Power Broker�s headquarters. Mangler, along with Poundcakes, defeated the Thing with their combined assault. (Captain America I#328) - Mangler joined his partner Bludgeon in attacking Captain America after he attempted to infiltrate Power Broker Inc. as a potential client. Despite their superior strength, Captain America was able to avoid their blows, and escape through a hole they smashed in a wall, only to be stopped by one of Malus' guards. When Captain America didn't return, D-Man followed him in and faced Mangler and Bludgeon in combat, besting the two of them. (Captain America I#363/2) - Mangler joined Bludgeon in forcing Priscilla Lyons, the Vagabond, into the limousine of Dr. Malus, so that Malus could coerce her into obtaining the handprint of the Power Broker for him. (Captain America I#364/2) - Vagabond obtained the handprint, but demanded that Malus leave Mangler and Bludgeon behind in order to obtain it. Vagabond managed to defeat Malus, and then phoned the U.S. Agent to inform him of the whereabouts of Malus and his men. (Captain America I#395) - Mangler participated in the call for a new operative in the Red Skull's Skeleton Crew, as sent by Mother Night. 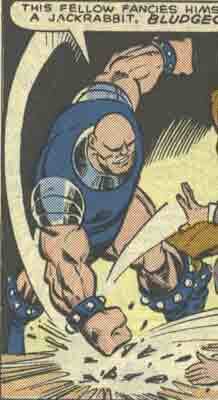 Mother Night had Mangler pitted against his rivals for the position--Cutthroat and Deathstroke--in a sealed room. Mangler and Deathstroke were ultimately both cut down by Cutthroat, who stabbed Mangler in the back. Cutthroat won the position. Mangler's alias is possibly derived from the lengendary wrestler "Strangler Lewis." 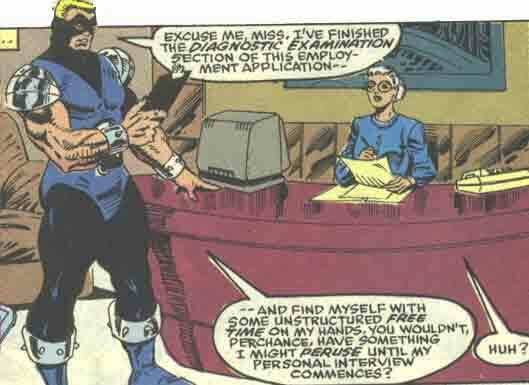 Thanks to Nyssane for pointing out Mangler's true first appearance in his Poundcakes profile.